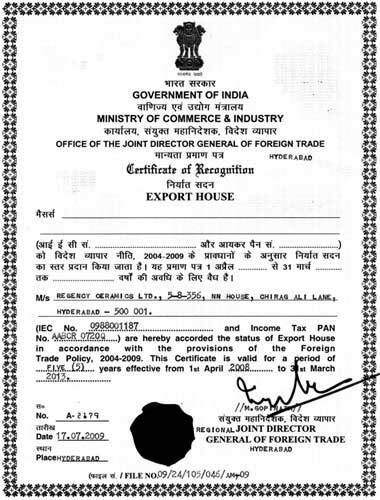 The Government of India have awarded the rare status of EXPORT HOUSE, in recognition of the outstanding and consistent efforts of the company in the field of Exports. Regency is the first and the only company among the manufacturers of Ceramic tiles to have been awarded such an honour by the Government. The company owes this recognition to the ever growing trust and confidence on Regency products by all its valuable customers in the overseas markets and uncompromising continuous efforts of the company to satisfy the customer needs with quality product supply on time, every time.